All events, materials, and publications, including but not limited to seminars, tele-seminars, books, e-books, audio books, CDs, video presentations, newsletters, and advertisements, accessed through this website are designed to educate and provide general information regarding the subject matter covered. They are offered and/or sold with the understanding that neither its authors nor the publisher are engaged in rendering legal, financial, medical, or other professional services. Each situation is different and advice should be tailored to an individual’s or organization’s particular circumstances. The authors and publisher specifically disclaim any implied warranties of merchantability or fitness for any particular purpose and shall in no event be liable for any loss or profit or other commercial damage, including but not limited to special, incidental, consequential, or other damages incurred as a result of specific investments or planning decisions made by the user. Any third party websites, including affiliates, which may be accessed through this website are the sole responsibility of the third party who is posting the website. 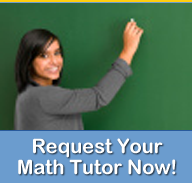 MathTutoringExperts.com and Math Tutoring Experts, LLC make no warranty as to the accuracy of any information on third party websites and accepts no liability for any claims, errors, and omissions or for any damage or injury to persons or property arising out of the use or operation of any materials, instructions, methods or ideas contained on such websites. Any offers, pricing, and/or promotions offered through Math Tutoring Experts, LLC, MathTutoringExperts.com, affiliates, or any third party are subject change without notice at the sole discretion of the party making the offer.